On “Device”, select the sound card if it is not selected already. On “Main” select the channel we named “Out 1” and, select the channel we named “Out 2” for “Aux.” This way, the generator signal, which will be the Reference Signal, will come out of the two channels. Click on OK and continue. Figure 11: Selection of the card and the two channels through which the generator signal will be output. 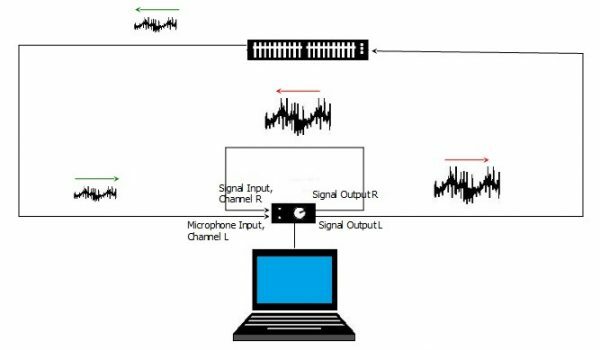 The connection scheme would be like the one we saw earlier, but replacing the amplifier, speaker and microphone with the electronic device we want to measure. In this example it is a graphic equalizer. We can use the line input if the XLR input gets overloaded. Figure 12: Connection diagram for an electrical measurement. Figures 13 and 14: Selecting the “Transfer Function” mode. 1.- Click on “New TF” on the lower bar, give it a name, click on OK and activate audio by clicking on the arrowhead. Figure 15: Active audio by clicking on the arrowhead. Figure 16: Initial setup of Averaging, Phase Smooth and Mag Smooth. 3.- If it isn’t already, select “Pink Noise” and click on “On”. By default the initial level in the generator is -48dB. Typically we’ll need to increase that so as to have enough signal. 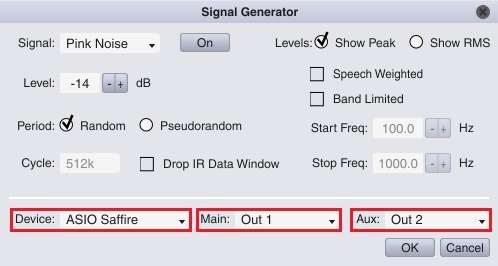 Figure 17: Activating the pink noise generator. 4.- Adjust the levels for the two inputs on the sound card so that they have the same unclipped level. If the microphone input is overloaded, we can use the line level input. The input VUmeters are the ones labelled M and R (which stand for “Measurement” and “Reference”) and can be seen in green and blue in figure 18. Yellow input VUmeters will still produce a good measurement. The Measurement Signal goes into the left channel (labelled “M”) and the Reference Signal goes into the right channel (labelled “R”). 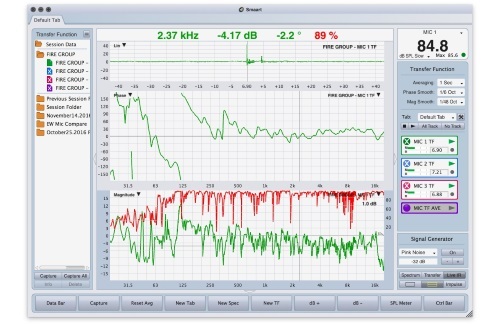 The signal level should not overload the input of the device being measured. It can be adjusted via the card’s output potentiometer and the output level in the Signal Generator. Figures 18 and 19: Finding the Propagation Delay of the signal. Caution! Make sure that the grey circle to the right of the delay field is not active (yellow). Otherwise Smaart will be continuously adjusting the “Propagation Delay” and we will lose the phase relationship between two measurements. The grey circle turns yellow when delay tracking is active.